Most people who own bettas keep them in bowls without a filter. In fact, one of the reasons they’re so popular is because they can survive in those conditions. They can live in stagnant water and seemingly require very little care. The truth is that keeping your Betta in a fishbowl without a filter can actually be hard work. You have to make sure you keep the water clean by changing it weekly. You also have to be very careful not to overfeed because any leftover food can lead to a lot of water quality issues. When something goes wrong in a bowl, thing progress really quickly. Dirty water can lead to infections, fin deterioration, and even premature death. Just because they can live in a bowl doesn’t mean they should. The best place to keep a Betta is in a tank with warm, clean water where it will be happy and stay healthy. Using the best betta filter will make sure that your fish has an ideal environment where it can thrive. Does a Betta Fish need a Filter? What is the Best Betta Filter? 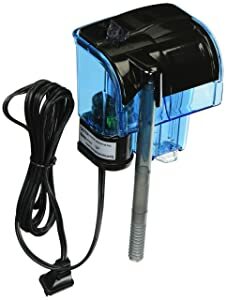 What Kind of Filter for Betta Tank? How do you slow down a filter for betta? How to baffle filter for Betta? How often does a Betta fish tank with a filter need cleaning? Using a filter for Betta is the easiest way to allow them to have a happy, healthy life. A filter facilitates the growth of tiny ecosystems of various microorganisms who help break down the waste in the water. While you have to change the water in a fishbowl every week, you’re actually not supposed to change the water in a filtered tank because it will disturb the beneficial microorganisms. Changing about 1/3 of the water every week is recommended. This is a lot less work than what is required with a bowl. When it comes to choosing a filter, Bettas do best with one that is low-output. It will help with oxygenation as well as cleaning and the low pressure won’t be too much pressure on your Betta. Let’s take a look at some of the best Betta filters around. 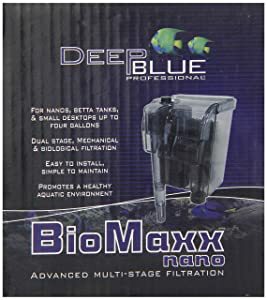 This is a great filter made by Tetra that’s ideal for a small aquarium up to 10-gallons, the perfect size for a Betta. Installation is simple as it mounts to the inside of the tank using either a hanger or two suction cups. There are 2 benefits to having the filter on the inside of the tank. The first is that you can push the tank flush against the wall because there’s nothing to get in the way. The second is that it’s exceptionally quiet because the tank is underwater. To keep your water as clean as possible, this filter uses 3-stage filtration. First, a dense mesh catches large pieces of waste and debris. Next is the activated carbon filter which soaks up any impurities, discoloration, and odors. The final stage is the Bio-foam where colonies of aerobic bacteria remove ammonia and nitrates before the water cycles back into the aquarium. This Penn Plax filter cycles 20 gallons of water every hour and is perfect for a small tank up to 7 gallons. It has a hang on design that simply slides over the edge of the glass into the tank. There’s a built-in leveling device to keep the filter in place and the intake tube is extendable so you can place it close to the bottom of the tank if you want. Your Betta will love the adjustable flow rate which allows you to slow the filter down a little at feeding time. As far as filtration, this system uses replaceable filters that should be changed every 6 to 12 weeks. The first stage of filtration is the poly-fiber floss barrier to catch large pieces of dirt and debris. Then, the water travels through activated charcoal to absorb any impurities that might be discolor the water or cause odor. There’s also a home for those all-important microorganisms to colonize in this filter to provide the biological filtration you need to eliminate ammonia and nitrates. These filters are made precisely for this machine. Changing them is super easy and there’s even a few filters included. Set up is easy and it’s ready to go right out of the box. For a 10-gallon tank, consider this internal filter from Aqueon. The flow rate is 57 gallons per hour and it only uses one small, replaceable cartridge. This is a pretty versatile filter. It’s internal and can be hung in a vertical or horizontal position. Plus, the flow rate, direction, and height of the water are adjustable. This is great for Bettas because they don’t really like water that’s too turbulent and prefer a gentle flow. There are 3 stages of filtration. The first is made of dense foam that catches all the particles and debris. Next is activated charcoal to stop toxins, discoloration, and odors. The final stage it the BioGrid where ammonia and nitrates are removed by microorganisms. One more important thing to mention is that this filter comes with a limited lifetime warranty. Another great option if you’re looking for a hang-on style filter is this one from Deep Blue Professional. It filters 16 gallons per hour and is meant for small tanks up to 5.5 gallons. That just happens to be a great size for a Betta tank. 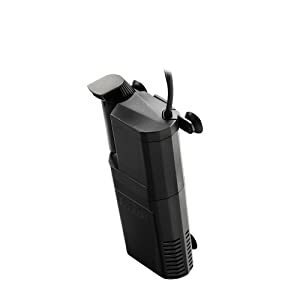 This filter allows you to adjust the flow speed, too, and has an optional intake extension tube so you can pull water from the bottom of the tank if you prefer. This filter features a 2-stage system. The first is a poly-fiber mechanical filter that catches large debris and waste. It’s also the perfect place for biological colonies to grow so that microorganisms can remove harmful ammonia and nitrates. 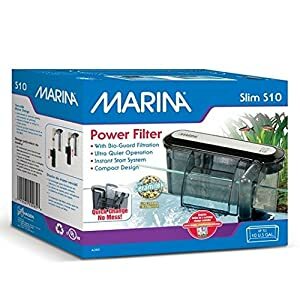 This Marina Power Filter is a hanging filter with a compact design that’s perfect for aquariums up to 10 gallons. Installation is really easy, you don’t even need to prime it! It’s a quiet filter, too, because the motor is submerged in the water. that has an adjustable flow so you can find the perfect speed for your Betta. They also include a strainer sponge to keep smaller Bettas or any debris from being pulled into the filter. One of the reasons this is such a good filter is because of the cartridges. It comes with 2 different kinds, Bio-Carb and Bio-Clear. They both contain Ceramitek, an extremely porous ceramic filter that provides plenty of space for biological filtration organisms to thrive. Your Betta will love any of these filters but the Penn Plax hang on filter is the best. It’s the perfect size because it works with tanks up to 7 pounds and installation is really easy. Because of the built-in leveling device, the filter will stay submerged. If you have a Betta that’s especially skittish, this is a great choice because of the adjustable flow rate. You can slow it down when it’s feeding time to prevent your Betta from being knocked around by a flow that’s too strong. 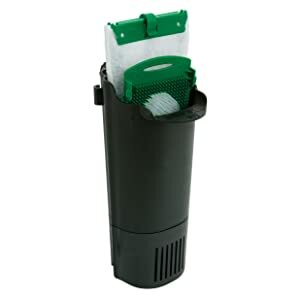 This system uses all-in-one filter cartridges that are really easy to replace. Each lasts about 6 to 12 weeks and provides the 3 important stages of filtration that you Betta tank needs: mechanical, chemical, and biological. You even get some filters to start with so you can set everything up right out of the box. While any filter is better than no filter, there are some features that a good Betta filter should have. It should be easy to care for and maintain, especially if you aren’t looking to spend too much time on maintenance. All-in-one filters are the easiest kind to work with because you don’t have to do anything but take out the old one and pop in a new one. A filter that goes under the water is quieter and causes less motion throughout the tank. Hanging filters are good, too. They’re easy to set up but the return spout can cause a lot of ripples on the top of the water. Bettas live in calm waters naturally and don’t particularly care for water that has a current that’s too strong. A submersible motor and adjustable flow rate are two things that give you control of the current so you can make the changes that your Betta prefers. As we mentioned, Bettas prefer water that’s calm. If you find that your filter is making the current a little too fast, there are some things you can do to modify your existing filter into one your Betta will love. One of the easiest things you can do is add more holes to the input tube or make it larger. This slows the water as it’s being pulled into the filter, reducing turbulence throughout the whole system. Another option is to change the filter media into something with more density. A denser filter holds back the water and forces it through the system, slowing the water down as it returns to the tank. One of the most effective things you can do it add a spray bar to the water return. Instead of having the water return in one steady stream, a spray bar spreads the water out over small holes to create a gentler current. All of these methods slow down the flow of the filter by someway impeding the water as it enters and travels throughout the system. If the water goes in slower, it will come out slower, which will make the tank a more pleasant environment for your Betta. Another way to slow down the water as it’s returning to the tank is to create a baffle. A baffle interferes with the water as it’s exiting the filter before it hits the water. This is a somewhat more preferred method because it doesn’t actually affect the operation of the filter. There are a lot of ways to create your own baffle but here is one of the easiest. First, get a plastic water bottle and clean it really well. Remove the filter and scrub it by using your fingers and hot water. Don’t use any soap or chemicals on the bottle, just your fingers or a clean cloth. Once it’s clean, place the water bottle under the outflow of the filter, horizontally. Mark the bottle to get the width of the outflow. Then, cut the bottle along these lines. You’ll end up with a tube that’s the exact width of the outflow. Next, make a long cut in the tube from the top to the bottom. Don’t cut it completely in half, you should be able to open it up into one large piece of plastic. Now, it’s time to attach it to the filter. Place one of the long sides of the tube behind your filter media so that the other end curves in front of your outflow. If this setup doesn’t work for your filter, all you have to do is place the baffle so that it interferes with the stream of water returning to the tank. They work by allowing the water to spread out and return to the tank in a smoother, calmer way. This reduces the turbulence and motion in the entire tank which leads to happier Bettas. First, let’s look at how the tank gets dirty. The waste that your Betta makes decomposes and turns into ammonia. Too much ammonia is toxic to your Betta, which is one reason why living in a bowl isn’t a good environment. Smaller tanks should be cleaned a little more frequently because they accumulate waste more quickly. You should change out about 25 to 50% of the water every week and do a good cleaning every month or so. Larger tanks can go a little longer. About 10 to 15% of the water should be changed every 2 weeks and you can go for months without a major cleaning. Remember, you have to change all of the water and do a thorough cleaning of a bowl that doesn’t have a filter at least once a week. It’s easy to see how a filter is a timesaver in the long run. If you go into your local pet shop, there’s a good chance you’ll see Bettas for sale in the small tank. You might think that this is the way the like to live, in a small space with stagnant water. While they can survive in such a habitat, it’s not the best place for them. Small spaces with stagnant water can very quickly become overrun with bacteria, nitrates, and other things that are hazardous to your fish. Plus, a Betta isn’t going to thrive in this kind of space. If you want your Betta to be happy and live a long time, consider getting a small tank with a filter. It’s really the only way to make sure the water is clean and healthy all the time. A visual of the do it yourself baffle may help me grasp the offered instructions. It is still unclear to me how the piece of plastic, a very clean slit water bottle, is to be attached to the filter unit. —Do I size the cut plastic piece to the filter outflow, make it into a tube (by tying w clean cord maybe), attach it to the filter’s outflow region and then maybe add exit holes along this tank height plastic tube? I guess I just do not grasp how to make this filter baffle.